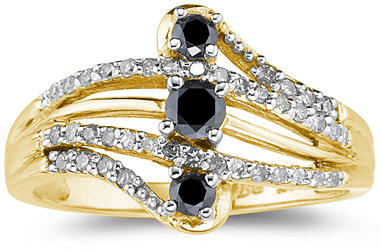 Striking colors in this beautiful black and white diamond ring set in 10k yellow gold. Three black diamonds weigh 0.30 carats with 0.20 carats of white side diamonds for a total of 0.50 carats of diamonds. Ring measures 12mm at widest point (just under 1/2"). Also available in white gold, shown below. We guarantee our 1/2 Carat Black and White Diamond Ring, 10K Yellow Gold to be high quality, authentic jewelry, as described above.